The new Bay Bridge will be come a little bit more of a looker starting early Wednesday morning. 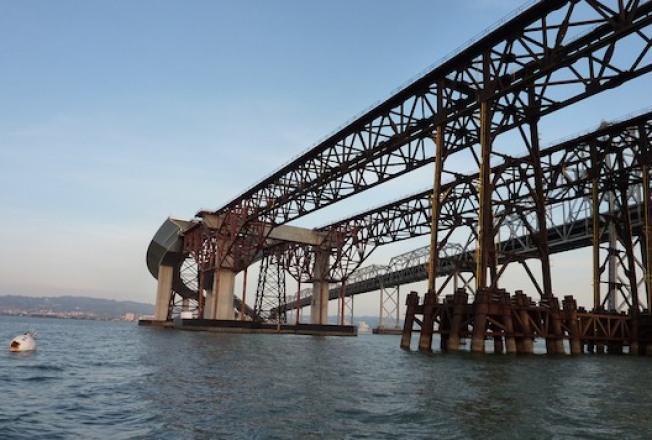 Construction crews will hoist four new 107-foot sections of the new eastern span's first tower starting Wednesday. The first section of the tower was installed in July. The new pieces of the tower are no easy feet to install. Each piece weighs 617 tons and the work will take five days to complete. But come Sunday, the tower will only be half its final height of 525-feet. Lookie loos should be prepared to keep their eyes on the road because the work will be visible from the current bridge. The bridge is still expected to be completed in 2013 at a cost of $6.3 billion.